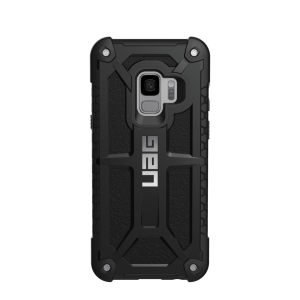 Urban Armor Gear (UAG) is a popular and reliable brand for phone cases. We’ve done many reviews for them in the past, and are pleased to review two cases that we’ve reviewed before, but are now available for the new Samsung Galaxy S9 phone. These cases are in the Monarch and Plasma series. We recently reviewed the Monarch case for the Samsung Galaxy S8 and S8+. This one we were sent has pretty much the same design, but of course, it is made to fit the S9, and there’s also one for the S9+. What I’ve noted about this case is the announcement of the top grain leather on the box. The leather part of the case really does feel nice to the touch, and looks to be of great quality. The other features of the case to be noted are pretty much the same as the other cases in the series. It has the sturdy UAG quality with a drop test rating two times military standard. It has the traction tire- like grip on the side. With a 5 layer protection, the case is very rugged, but also light weight. It does add a bit of bulk to your phone, but that’s the cost of protection. The case does fit around the edges of the phone so you can lay the phone on its face without worrying about scratching. Easy access to your buttons, good cut-outs for the ports on the bottom, and cut right on the back so you don’t get the glare from the flash. This case runs at $59.95, and comes with a 10 year warranty, so you know there’s a good value. We were sent the black case, but it also comes in red for a sleek contrast as well. As with the Monarch, we’ve also reviewed several cases from the Plasma series. The Plasma series seems to cover just about everything from phones of many different brands like LG, Huawei, iPhone, and Samsung, and also Surface laptops. So, it’s natural that they would come out with a case for the newest Samsung Galaxy phones. Coming in an array of colors like Cobalt (pictured), Citron (a yellowish green), Ash (black), and Ice (clear), these cases offer a three layer protection. There are shock cushions in the corners, and the case has been drop tested to military standard, also. 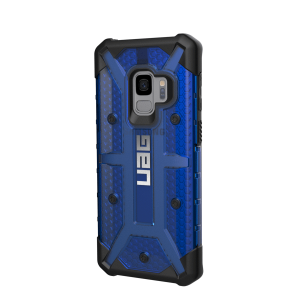 UAG does a superior job in making lightweight, but sturdy cases, and this one is no exception. It is not as rugged as the Monarch, but offers many of the same features. It’s also a bit less expensive at a price of $39.95. We can safely say that both cases could be recommended by us, and will take this moment to say thanks to UAG for sending us these cases for free in exchange for a fair and unbiased review.